As we are tent campers there hasn’t ever really been a need for us to use a generator. Our needs are relatively simple, though our fully packed car sometimes doesn’t reflect that. When we were offered to opportunity to test drive a Honda EU20i generator for the weekend, we realised we knew very little about them, as we have never had the need to try one. So we were keen to see what they can do! 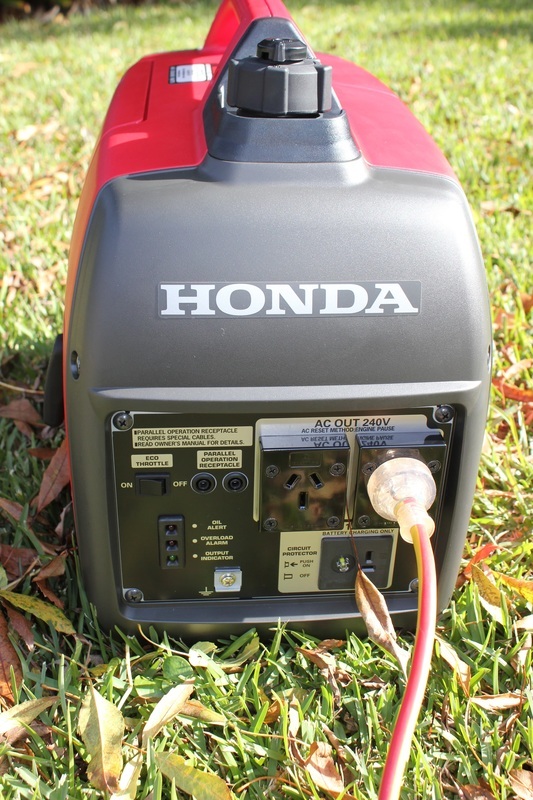 The Honda Generator is an inverter generator. This means for camping, the generator will maintain a high level of accuracy with voltage. The EU20i features a microcomputer-controlled sinewave inverter that guarantees commercial-quality electricity – making it ideal for use with frequency-sensitive electrical equipment such as laptops. The part that appeals to me, the less noise option, because that is one of my greatest issues with generators I have seen in use. The noise. Read on to see what we thought of this aspect. If you are looking to find out about the engine (it’s a GX100T), or the ignition system, and AC Output (it’s 2000VA) and all of those important matters, best to check out Honda’s own page on specifications of the EU20i. One thing I did learn about generators, is that you need to check what your needs are for your appliances (peak wattage) so you make sure the generator can meet your needs. This one is 2000VA, which should power most appliances you would need on a camping holiday. Because it’s an inverter model, you can plug in your laptops and technology devices to charge them. Now these are sensitive devices, but the Honda EU20i technology means that damaging surges won’t be an issue. In regards to technical matters, and the inner workings of the generator, then unfortunately, I am no mechanic. Its 21kg, so for me, that’s heavy to lift. Others may not struggle as much, as it is considered lightweight for generators. When someone actually could get it out the box for me, it was imperative to read through the manual beforehand because unlike many men, I like to read the manual and make sure I operate everything as the manufacturer recommends. You need to do a pre-operation check to investigate the engine oil level. Oil needed is 4-stroke motor oil (there is an automatic stop system if you forget this and the oil falls below a safe level, which is handy if you aren’t familiar with these sorts of checks). The generator takes unleaded petrol. But apparently you need to make sure the petrol isn’t older than 30 days in the generator. If so, you have to drain it out and add more. Luckily for us, Honda had supplied a generator with the oil and petrol already in the machine. We did not have the ability to see how much was in the tank, so were unsure on how long we could expect the generator to run. Starting it up was like starting a mower, in fact, I found it a lot easier to start this than our mower. There is a button on the generator called an Eco Throttle. What this means is when switched on, the generator can run for up to 10 hours on ¼ throttle, so less fuel usage (always important considering how expensive petrol is these days). There are output and overload indicators, to give you a guide to the working of the generator, and identify issues. Run time – on full throttle, the generator will work for 4 hours. We used it, on Eco throttle for 30 mins with a simple household appliance. No issues. Our second appliance ran for about 5 minutes, and then nothing! We can only assume the generator had run out of petrol. There was no way of knowing, because there is no gauge to tell us if this is the case or if there was another problem. As mentioned, this is one area of concern for me. The specifications rate the Honda as at a decibel level of 53dB(A)*/59dB(A) – which is pretty quiet. On a decibel chart that level is considered "quiet conversation". There is no doubt, there is noise associated with the running of it but it is not excessive. We have been close to campers using other models, and the noise is unbearable even from a distance. This was vastly better in terms of noise. If sitting next to it, naturally you will be aware of the running generator. It's not silent. But you wouldn’t, ideally, sit next to it. Place the generator behind your vehicle or some distance away, and you will find you don’t notice it running. The lack of noise this generator made was better than I had hoped for, and I have read that this is one of the reasons why this is such a high selling generator. Regardless, I still see why campers move generators away from their immediate proximity, because there will always be some noise generated, and of course some petrol fumes. 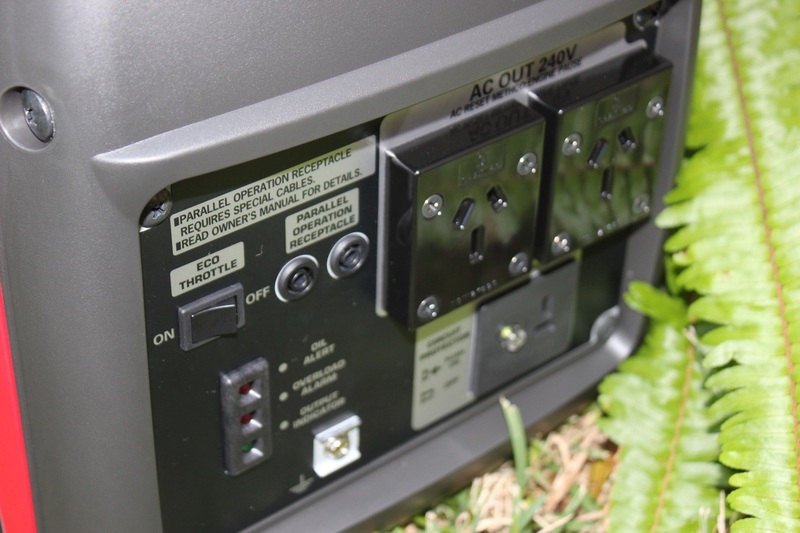 There are 2 x 240V outlets available so you can charge up 2 appliances as well. Some other popular models only have 1 outlet. For our solar use - we rely on nice sunny day. With this generator, no matter what the weather is like, we could always have power. From an aesthetic point of view – admittedly not that important to most people – it’s sleek and well designed. No fuel gauge - that would something that would be handy to have. How can we know how much petrol is left? The only way we found this out was when the generator stopped working. We had no extra unleaded petrol nearby to restart but if you were a long way from anywhere, you would need to be better prepared. The weight - it's not super lightweight but I doubt any generator is. It’s apparently the portable model – which is a positive, because I would hate to have to try and carry a non-portable version. The price for this is RRP is around $2000. For those who are going off grid in large camper trailers or caravans/motorhomes (all of which are expensive vehicles anyway), this amount may not be considered a huge outlay to help power your vehicle when off grid. It is probably something you may have had to factor in when purchasing your camping vehicle in the first place. The price reflects the ability to handle most power requirements you need, and the reduced noise. No camping story on generators would be complete without a reminder that the use of generator and their use within National Parks. It’s important before camping in these parks, and wanting to use a generator, you check that it’s allowed. South Australia– not allowed in most parks, unless for medical reasons. Read more here. In New South Wales – please read here. Some Parks do allow them. For Victoria, generator use is generally not allowed anywhere, but check for every Park. In Western Australia, they have a number of campsites that do and do not allow generators so you need to choose your campsite accordingly. You can see the list here. Queensland – seems to allow generators in many of it’s National Parks, but you do need to check this website to find out which ones allow them (not all do). Northern Territory – has campsites with designated generator areas. See full listing here. Tasmanian generator use depends on which park you are at. You need to check each Park individually to find out which ones allow. 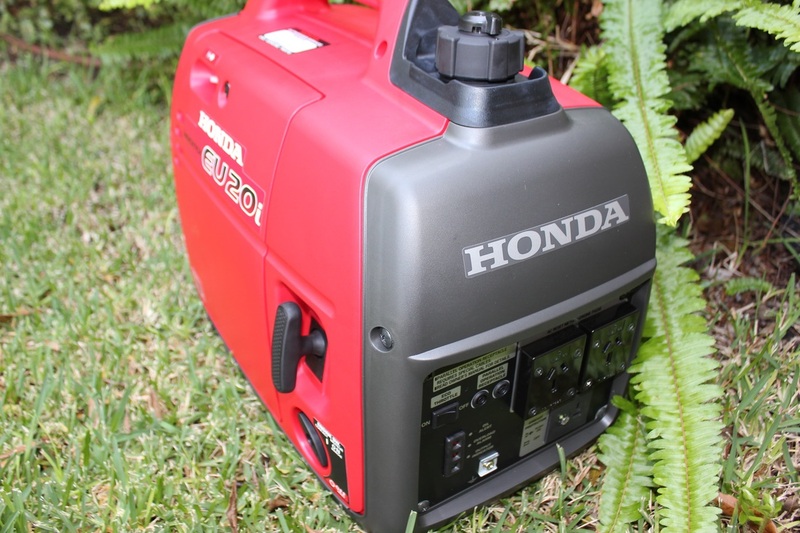 If I were in the market for a generator, then based on our brief time with this Honda generator, it would be one that we would consider. 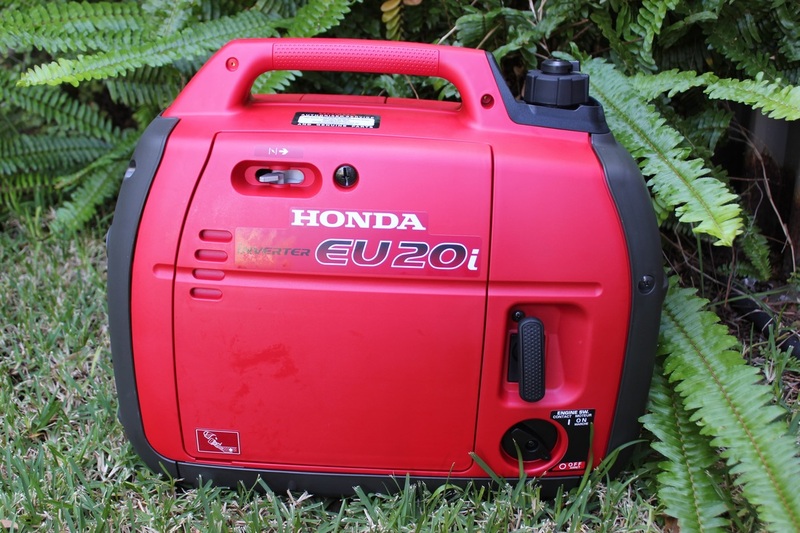 For those campers who are looking on doing bigger trips in your vans, which come with appliances needing power, then a generator is probably going to be on your shopping list and you should investigate this Honda EU20i further. Need more details about the EU20i? Visit Honda website. Please note that for the purpose of this review, the Honda EU20i was loaned to us for a weekend.